The new Eartube Mark II headphone amplifier will come out in a new and wonderful looking re-design in optic and technicial thinks. For many interested earphone-enthusiasts, who spend a lot of money on their hobby, only a melodious tube amplifier is possible as a driver. The answer to the question: � Which do I take? 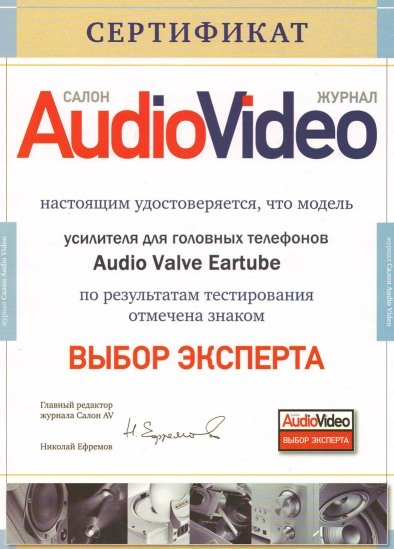 � can only say: the EARTUBE of AudioValve! The Eartube was developed especially for the highest-quality reproduction with earphonesand serves very well impedances of 16 to 200 ohms. He unfolds his big strength with roughly 4 watts per canal in 100 ohms. For that reason he is very well suitable e.g. for the K1000 by AKG. The Eartube is a pure tube amplifier and owns no semiconductor in the signal way. 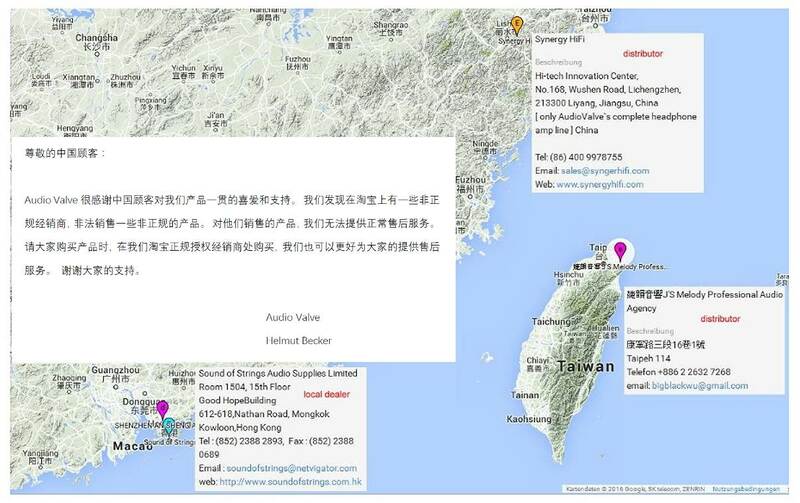 Merely the stabilization for the tube heatings and anode tensions occurs highly exactly with semiconductors. The amplifier owns two switchable entrances with different delicacy. 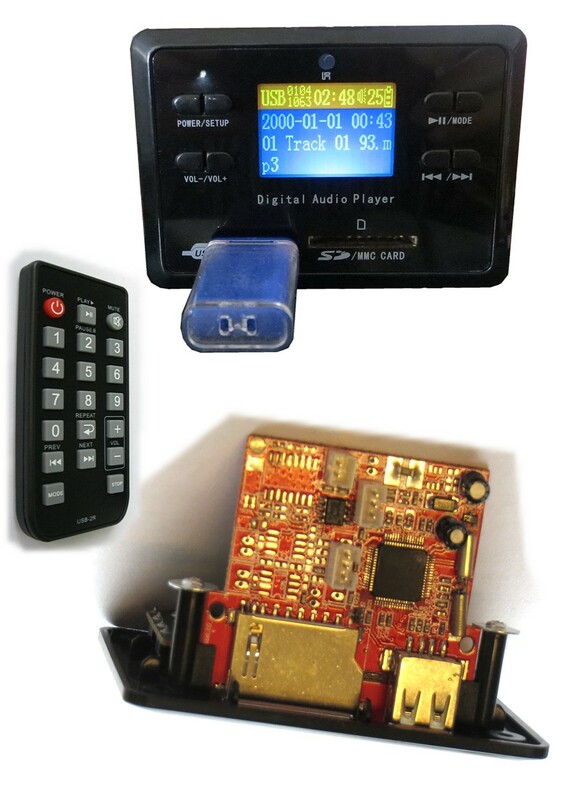 Thus can be connected, e.g., CD player and TUNER at the same time. The input circuit of the amplifier owns three tubes of the Type 6N3P and prepares the signal for the output stage tubes. In this area of the circuit also the volume potentiometer with the shiftable or detachable Crossfeed filter is located, to distribute potential signal bass charge on merely one ear to both ears. The output stages use the power Tetrode of the type: QQE 03/12 as the military version by SIEMENS and work in circuit PP with a transformer which is tuned especially to the interests of earphones. The final tubes work constantly in Class A and are postregulated automatically optimally in the Bias closed current, so that tolerance and aging of the tubes do not matter. The care tensions are won from a strong, free of litter, Torodial-Transfomator. 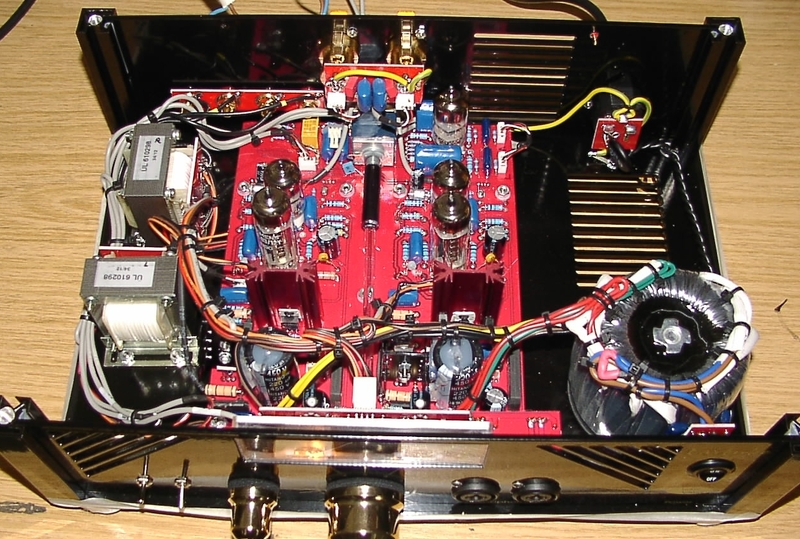 The amplifier itself rests on one single two-page printed circuit board and was adapted signal-technically optimally. For this reason also the potentiometer is in the rear part of the printed circuit board to hold the signal way short. All parts on the PCB are of the best quality and selected carefully to do justice to the requirements of the reproduction in every regard. The case is from metal and prevents interferences from the outside. It is available in the colours black and silver. 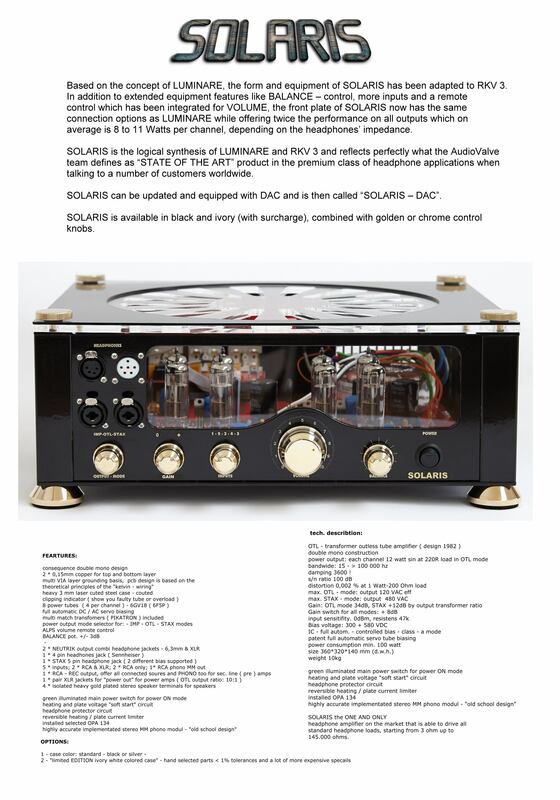 Like all products of AudioValve this amplifier also distinguishes itself especially by his exceptional musicality which is based at last also on the fantastic technical values of the circuit and their stability. As a user you will be able to enjoy this product in the highest perfection for many years enthusiastically and come with it to the pleasure of fantastically detached musical reproduction with your headphones. 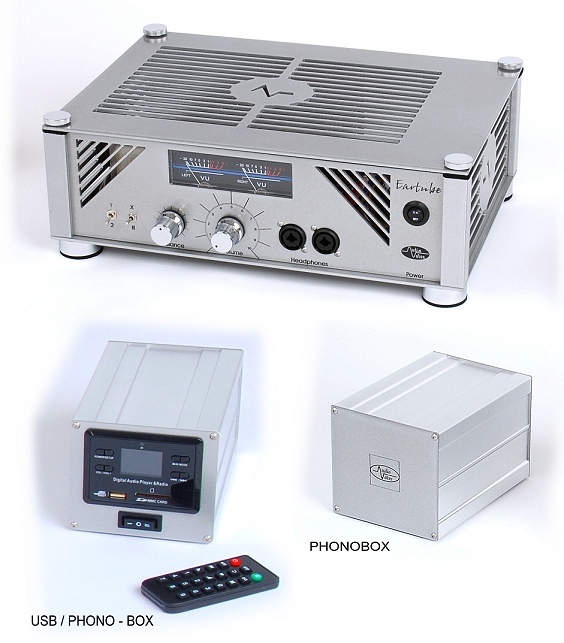 Pour de nombreux amateurs de casque int�ress�es qui passent beaucoup d'argent sur leurs passe-temps, juste un amplificateur de tubes harmonieux est en cause comme le pilote. La r�ponse � la question: �Qu'est-ce-je prendre?" ne peut signifier: l`EARTUBE d`AudioValve. L`EARTUBE a �t� sp�cialement con�u pour la lecture de haute qualit� � travers les �couteurs et servant d'imp�dances de 16 � 200 ohms excellent. Il d�plia sa grande puissance avec pr�s de 4 watts par canal sous 100 ohms et est donc id�al par exemple pour le K1000 de AKG. 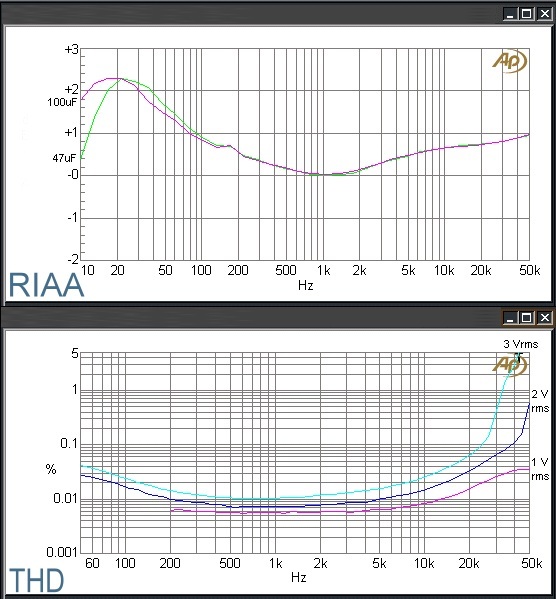 Le EARTUBE est un ampli de tubes pure et n'a pas de semi-conducteurs dans le trajet du signal. Seule la stabilisation de la chauffe du tubes et des tensions d'anode sont des semi-conducteurs de haute pr�cision. L'amplificateur dispose de deux entr�es commutables avec des sensibilit�s diff�rentes. Comme ca, par exemple les lecteurs de CD et les tuners peux �tre connect�s simultan�ment. Le circuit d'entr�e de l'amplificateur dispose de trois tubes de l'6N3P type et pr�pare le signal pour des tubes dernier �tage. Dans cette zone du circuit est aussi le potentiom�tre de volume avec le filtre Crossfeed allumable et d�connectable, pour distribuer un charge eventuel de signal basse sur juste une seule oreille aux deux oreilles. Les amplificateurs de dernier �tage utilent la puissance t�trode type: 3,12 QQE dans la version militaire de Siemens et travaillent dans le circuit de PP avec un transformateur qui est adapt� aux besoins des �couteurs. Les tubes de sortie sont constamment dans la classe A et sont automatiquement ajust�s optimale dans le courant de repos Bias, alors les tol�rances et le vieillissement des tubes n'ont pas d'importance. Les tensions d'alimentation sont issus d'un transformateur toro�dal fort et libre de la dispersion. L'amplificateur lui-m�me repose sur une carte imprim�e bilat�rale et a �t� modifi� de signalisation optimale. Pour cette raison, aussi le potentiom�tre se trouve � l'arri�re de la carte imprim�e, pour garder le chemin du signal � court. Tous les composants sur la carte imprim�e sont soigneusement s�lectionn�s et de la plus haute qualit� pour satisfaire aux demandes de la lecture � tous �gards. Le bo�tier est en m�tal et emp�che l'entr�e des �trangers. Il est disponible en noir et argent. Comme tous les produits d`AudioValve, aussi cet amplificateur est caracteris� de son musicalit� exceptionnel, qui se fonde en d�finitive sur les valeurs �tonnante technique du circuit et son stabilit�. Comme utilisateur, vous pourrez profiter de ce produit de perfection pendant de nombreuses ann�es et b�n�ficier de la fantastique lecture d�tach� avec votre casques d`�coute. Tube: 3 x 6N3P and 2 x QQE 03/12 (Siemens long life military version). This is an amp for relaxed and comfortable listening. 2 pairs of Gold-plated RCA - input jacks. Silver or gold plated knobs . Alps log- - potentiometer for volume control. 100 and 245 VAC main voltage versions available. high precisition plate and heating voltage lines. Size: wide: 38cm x deeph: 26cm x high: 12cm. Power : Long press for stanby ,and lon g press again will wake up . VOL- : Volume down and minus for setting Time , Alarm ,and Timing swith off. VOL+: Volume down and Plus for setting Time , Alarm ,and Timing swith off. default is all song repeat . MUTE: First press mute , press again will release from mute. channel and save them in FM state. Button 0-9 : select song in USB/SD state, if the song number over 9 , just input the numbers in series. After the summer vacation we will have as a new unit an digital audio player who can handle USB - sticks or SD - memory cards up to 8 GB with music files in MP3 and WAV file format. Also its unit have a FM receiver. 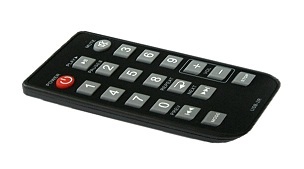 Its functions all can be handle from front panel buttons or from the remote control. 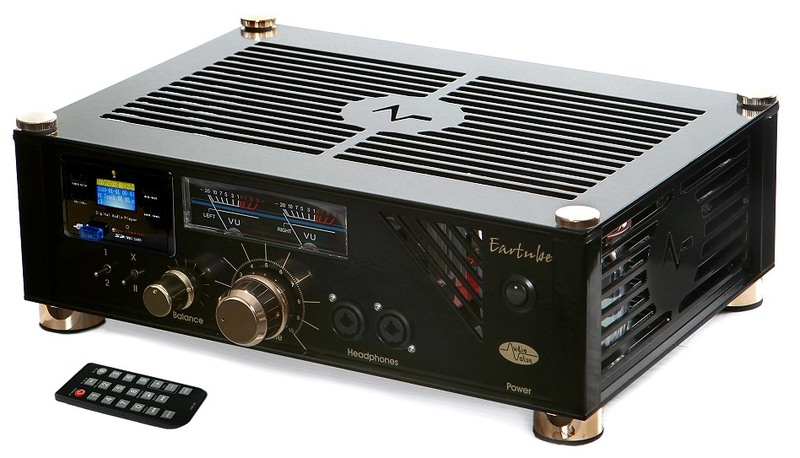 The best of all is - its unit has an MM - phono amplifier integrated too. The technologie is very popular "OLD SCHOOL" transistor technology and very very good to combine with a vinyl turntable player. One line OUTPUT for the pre amplifier. 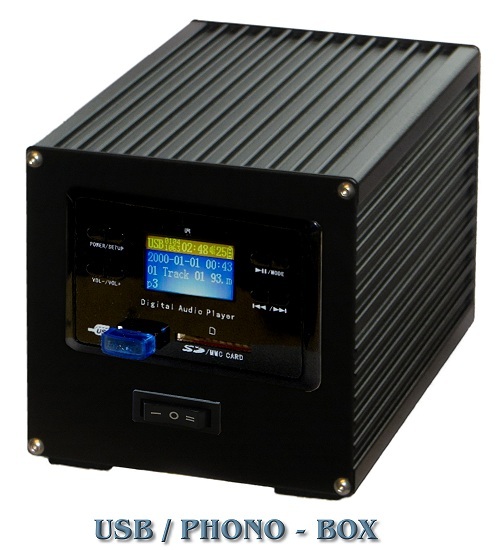 We deliver its unit with an universal main power adapter for 100 - 250 VAC and a remote control.